Irrespective of whether you have a large or small outdoor space, installing outdoor speakers is one of the best additions that will musically enrich your compound ambiance. These speakers provide you with the opportunity to extend your indoor entertainment to your outdoor environment. This article seeks to furnish you with the necessary information you need on how to install outdoor speakers in your home. You can use the tips provided in this article to do the outdoor installation in the patio, outdoor seating areas, the deck, and any other place where you want the music to reach. Since the outdoor of your home is diverse, you need to determine the right location to install your outdoor speakers. After selecting the ideal site such as the deck or your backyard, you have to inspect it and make sure it conducive for installation. Additionally, prepare the site and rid it of anything that may hinder the free flow of the wiring process if told you will be installing cable speakers. Next, you have to install the external volume control box (or boxes) outside and keep it (or them) in a shelter. You can fix the boxes on the wall of your house or any other place that will keep them free from damage. At this stage, you now need to install the amplifier that will control the speakers’ voice output. The type of amplifier you will fix will depend on the kind and number of speakers you want to install. After deciding on the right site, and you have prepared it, make sure you have the correct wire gauge for the installation. Additionally, you need to ensure that the wires are long enough to finish the job. The reason is the cables will be exposed to different weather conditions and elements that require extra toughness and strength. The distance between the receiver and the speakers will determine whether you will need to bury the wires or not, as well as their thickness. You need to place the speakers in areas that have shelter to prolong their life. Also, ensure that the distance space between the speakers is not too small or large so that there is no overlapping or difficulty in hearing. Moreover, you will need to listen to the speakers before installing them. This measure will spare you the hassles of having to unmount the speakers again after installing them. Another thing you need to remember while mounting the speakers is the height. Don’t place them too low (below 2.5 meters) or too high (above 3 meters) so that you don’t encounter difficulties enjoying the bass and volume. Lastly, you need to do the mounting as per the provided guidelines. It is important to test the speakers’ sound quality before leaving the installation scene. Make sure that the speakers are not producing a fuzzed sound. If there are fuzziness and distortion in the system, you need to counter check the entire process as per the instructions provided for the receiver and the speakers. These guidelines will show you the root of the problem such as mismatched connections. Afterward, you can fix the issues (if any) and wind up the installation process. 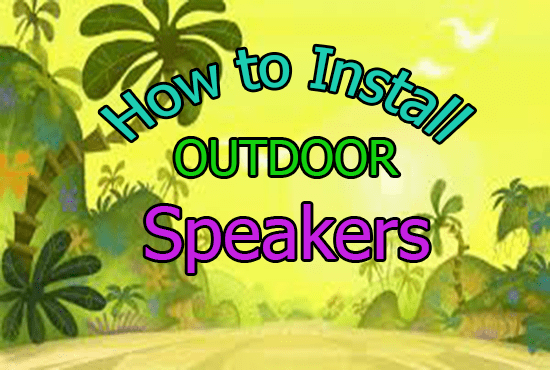 This guide has furnished you with all the facts and instructions you need to know on how to install outdoor speakers. You will need to follow each of these steps with simplicity because they don’t require any special expertise to apply them. By so doing, you will be creating a conducive environment for you and your family to enjoy the best music entertainment ambiance beyond the four walls of your house.